Bumpy snowmobile trails a problem? Smart Seat is the answer! Bumpy snowmobile trails are a fact of life for many snowmobilers. Why are bumps so objectionable? Bumps reduce enjoyment. You certainly don't need to be told this if you've ever gone on a 100-mile ride on trails covered with teeth-chattering moguls. Bumps can cause vertebral (back) fractures. Bumps increase rider fatigue, and therefore increase the chance of an accident. Snowmobile manufacturers have attempted to isolate the rider from bumps by offering long-travel suspensions and thicker seats. These measures have helped, but ride quality is still far from perfect. Why is this true? The full range of motion (ROM) is rarely achieved. Understandably, manufacturers need to make springs stiff enough so there is a reserve of compression for the big bumps. However, when smaller bumps are encountered only a fraction of the ROM is obtained. The ROM is usually considerably less than what the manufacturers claim. In an attempt to impress consumers, they often quote the distance that some part travels in its arc of compression. The only figure that matters is the vertical compression that the entire suspension can achieve; this is usually 3 to 5 inches less than the inflated numbers that manufacturers quote in their literature. The reaction characteristics of LTS actually help create more bumps and increase the size of existing bumps. The primary problem with seats is that their ROM in comparison to the thickness of the seat is very poor. What good is 8 inches of foam rubber if it compresses only a fraction of an inch as you traverse a bump? Obviously, not much. Take a look at the photograph below on the right that reveals how little the seat compresses in response to the weight of the rider and the force of hitting a moderate "up" bump. What's an up bump? It's an elevation that imparts an upward acceleration to the vehicle frame. Conversely, a down bump is a depression that imparts a downward acceleration. As poor as foam rubber seats are in responding to up bumps, they're even worse in responding to down bumps because their negligible compression doesn't permit much ROM in expansion. The Smart Seat substantially improves ride quality by offering 5.8 inches of vertical travel. While seats typically have about 8 inches of foam rubber, it is impossible to fully compress the seat to achieve that ROM. In fact, your vertebrae will fracture long before full compression is achieved. Therefore, in terms of ROM, seats may as well just be small springs sitting on top of bricks. While it's true that a certain amount of padding is necessary to distribute body weight, this can be accomplished by using a few inches of foam rubber. Thus, most of the vertical space taken up by standard seat cushioning material is wasted. In contrast, the Smart Seat permits almost 6 inches of vertical motion because it is designed to almost fully collapse so that the maximum ROM is achieved. 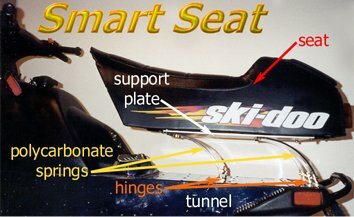 The Smart Seat consists of three main components: (1) a support plate (which is not required if the seat itself is sufficiently sturdy) made of aluminum plate, (2) curved Smart Springs molded from polycarbonate (Lexan®), and (3) hinges that attach the bottom of the springs to the tunnel. Lexan® is an incredibly tough plastic that is used in a number of applications such as shatterproof windows and bulletproof windows and barriers. The standard Smart Seat is designed to respond to both up bumps and down bumps. 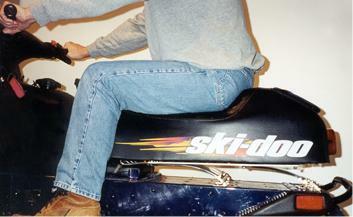 When the rider sits on the seat, the springs compress about halfway (slightly above the position shown in the above photograph on the right). From that mid-position the springs can either further compress in response to an up bump or further expand in response to a down bump. The effect of this is that the Smart Seat offers a much smoother ride by effectively filling in the down bump depressions and clipping the up bump elevations as shown in the adjacent diagram. Can the Smart Seat be customized? Yes! Some riders may prefer to limit the elevation in ride height by choosing Smart Springs that fully collapse once the rider’s weight is imposed upon the seat. Such a Smart Seat responds only to down bumps but still offers a remarkable increase in ride quality. The Smart Seat can be adapted for use on personal watercraft, motorcycles, ATVs, tractors, and other vehicles.